Congress has imposed annual numerical limits on the issuance of immigrant visas. The limits are imposed by category (i.e. employment-based, family-based, or other special immigrants) with each country subject to additional limitations. 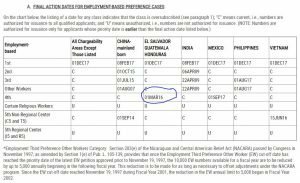 Permanent residence applications for SIJs and other special immigrants are processed as part of a catch-all category designated as “Employment-Based, 4th Preference,” or “EB-4,” category. The overall numerical limit for permanent EB-4 immigrants is 10,000 per year. In addition to SIJ, religious workers, employees of U.S. foreign service posts, former U.S. government employees are eligible for these 10,000 visas. This number includes the immigrants plus their eligible relatives meaning the actual number of employment-based immigrants is less than 10,000 each year. There is also a limit on the number of immigrants who may come from one country, which is limited to no more than 7% of the total number of people immigrating to the United States each each. With 30,000 SIJ petitions pending last year, there will likely be more SIJ beneficiaries than available visas in a given year. To keep track of the complicated calculations, USCIS issues a Visa Bulletin each month that tell SIJ beneficiaries (and their attorneys) when a visa might be available for them based on their country of nationality by issuing a “Final Action Date” for the EB-4 category, with columns for specific countries. The final action date means that USCIS can adjudicate pending I-485 applications for SIJ beneficiaries with priority dates on or before that date (yes before or further back in time) through the entire month of the related visa bulletin. The priority date is determined by looking at the “Receipt Date” on the I-797 Notice of Action (example below) for the underlying I-360 petition. When the Receipt Date is on or before the Final Action Date, the child has reached the front of the line. USCIS or an immigration judge will review their permanent residence application to determine if they qualify. For example, in the visa bulletin from February 2019 below, USCIS can adjudicate an application for adjustment for a child from El Salvador with an approved I-360 application that was filed on March 1, 2016 or earlier (i.e. Feb. 2016, Dec. 2015, etc.). If, and only if, USCIS has jurisdiction over the adjustment application (see below), attorneys should look to the chart of “Filing Dates” to determine if the client is eligible to file the application before a visa may be available. USCIS cannot adjudicate the adjustment application when a client has an order of removal, or is currently in removal proceedings because 8 CFR 1245.2(a)(1)(i) awards the Immigration Judge (IJ) exclusive jurisdiction over the application to adjust status (Form I-485) when removal proceedings have been initiated. If an I-485 application has been administratively closed by USCIS because removal proceedings were pending, USCIS cannot reopen the case unless removal proceedings are terminated first. Administratively closing the removal proceedings (which is no longer possible except in very limited circumstances after Matter of Castro-Tum) would not help in this situation because the IJ still has exclusive jurisdiction. If your client has an order of removal, you should investigate options for moving to reopen the case before filing any application for adjustment (don’t file the I-485 application with USCIS)! If reopened, the court will have exclusive jurisdiction over the adjustment application. Seeking a joint motion to terminate with the DHS attorney is unlikely in the current environment, but always worth a try by reaching out the ICE-Office of Chief Counsel in your local jurisdiction. Matter of S-O-G- and F-D-B- removed the IJ’s ability to exercise discretion in terminating removal proceedings (i.e. to seek adjustment of status before USCIS) except when there is an independent legal basis (i.e. DHS cannot sustain the charges of removability). DHS would have to dismiss the Notice to Appear as a matter of prosecutorial discretion to allow the child to adjust before USCIS. In short, unless a case was terminated by an IJ before September 2018, 1) the IJ probably will not terminate the removal proceedings, 2) DHS probably won’t dismiss the NTA in order to terminate the removal proceedings, 3) USCIS can’t reopen an administratively closed application or adjudicate an I-485 application unless removal proceedings have been terminated, and 4) therefore you should always file an application for adjustment of status with the court when your client is in removal proceedings or has an order of removal. Cautionary Tale: If you ask USCIS to adjust your client’s status when the immigration judge has jurisdiction, you might get your wish and receive a green card. While that sounds exciting, it can cause a procedural mess for your client down the line, especially if the IJ does not terminate removal proceedings, or the removal order is still on your client’s record when she applies to naturalize. If you try and correct the record, you risk the chance that your “visa” has been used in the prior adjustment application meaning you must start at the beginning with the I-360 and go to the end of the line. If your client has turned 21, or married, they may no longer have a path to residency. How do I present an adjustment of status case in Immigration Court? To adjust in court, you will need to present your evidence of your client’s eligibility for adjustment to the IJ at an Individual Hearing. If your client does not already have one set, and does not have a Master Calendar hearing coming up to request the Individual Hearing, we recommend filing a Motion to Advance requesting a master or individual hearing for the I-485. The Immigration Court Practice Manual requires you to wait until your client’s priority date is current with the Final Action Date in the visa bulletin. Include proof that the priority date is current and that the I-360 is approved. The filing fee for an I-485 for someone 14 or older is currently $1140; if your client is eligible for a fee waiver, include an I-485 Fee Waiver Motion. If (and hopefully when! ), the IJ signs the order granting the fee waiver, follow the defensive I-485 filing instructions (which include sending a copy (not original) of the I-485 to USCIS to they can schedule biometrics). Then, file your I-485 plus supporting documents with the court once you get your receipt notice. At the individual hearing, your client bears the burden of proof by a preponderance of the evidence (more likely that not) that she is eligible to adjust status. Be sure to review any inadmissibility issues, and clearly present statutes or regulations that exempt your client from certain bars to admission and/or waivers when appropriate. You can file an I-601 application to waive certain inadmissibility grounds. Adjustment of status is always discretionary so be sure to present evidence to merit additional discretion for your client. On the positive side: The Immigration Judge does not have jurisdiction over the I-360 which focuses their ruling on the adjustment of status and not re-litigating the underlying state court order or contemplating revocation of the I-360 as we have seen happen recently at USCIS. Note that USCIS still has jurisdiction to rescind a green card issued by an immigration judge, in limited circumstances, for up to five years. © 2019 Children’s Immigration Law Academy. All Rights Reserved.